travel Archives - Who Said Nothing in Life is Free? 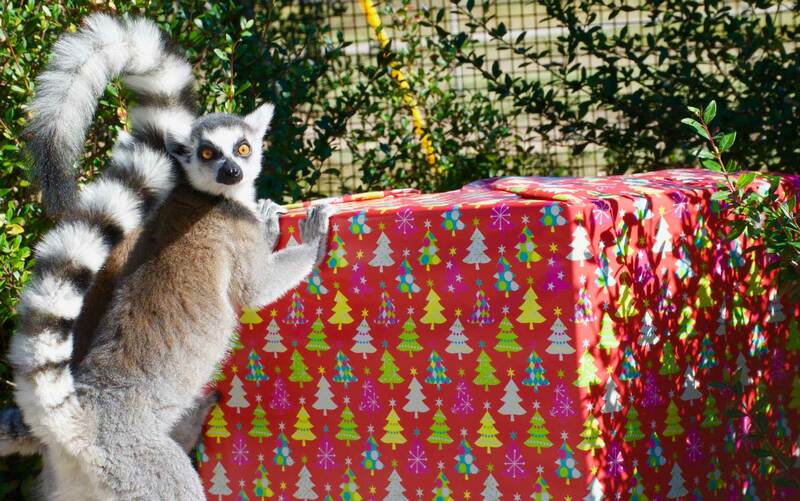 Join us this holiday season at Safari Wilderness in Lakeland, Florida, for our Critter Christmas Safari. Special holiday safaris depart on the hour, every hour, from 1 p.m. to 5 p.m. Tickets are available on location. Unlike our traditional safaris, advance reservations are not required. A 45-minute customized vehicle safari, led by one of our knowledgeable tour guides. A guided walking tour of our small mammal house, free-flight aviary, and petting zoo barn. Get up close and personal with some of our smaller species! 1 poinsettia for each visitor. Our staff will be bringing out some of our smaller animals (coatimundi, ferrets, dwarf caimans, etc.) for educational demonstrations. This is a very special treat that doesn’t happen on our standard safaris! For an additional fee, we will also be facilitating opportunities to feed our lemurs, as well as some of the animals you might expect to see in a nativity scene (camels, goats, pigs, horses, etc.). Our popular lemur feedings will also be available for purchase upon arrival. About Safari Wilderness: Located halfway between Tampa and Orlando in a 260-acre wilderness area, Safari Wilderness offers an intimate, up-close encounter with herds of free-roaming animals in a breathtaking natural setting that rivals the African savanna. Safari Wilderness is not a zoo or theme park. There are no crowds or lines – just your small group of adventurers and an experienced guide driving a custom safari vehicle, fitted with a shade canopy. 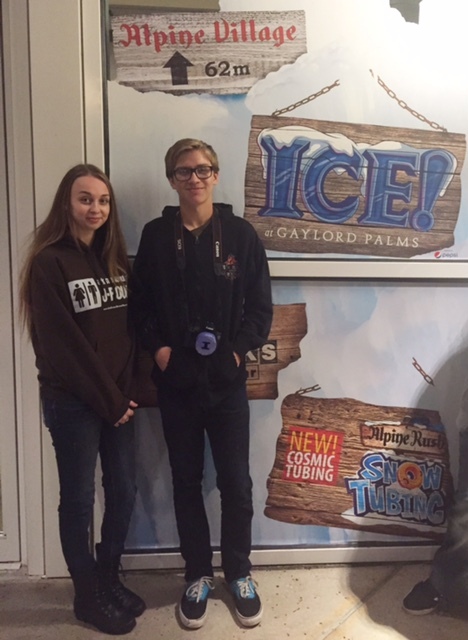 Once again, ICE is back at Gaylord Palm Resort in Kissimmee Florida thru January 3. 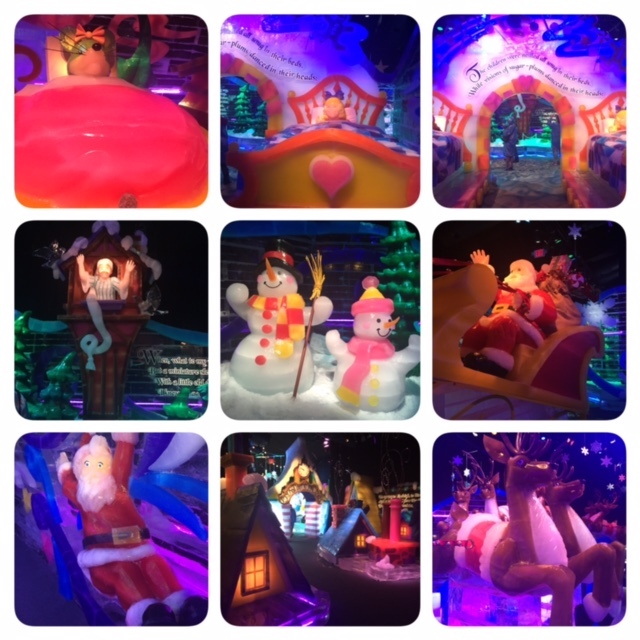 Featuring ‘Twas the Night Before Christmas, you will experience an unforgettable winter wonderland. This amazing showcase uses nearly 2 million pounds of ice, hand-carved into vibrant ice sculptures. 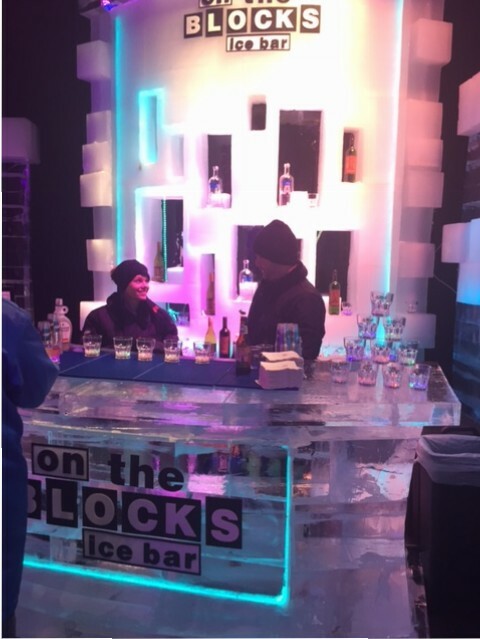 Plus make sure you look for the On the Blocks ICE bar. I had the best drink there which helped to warm my insides ! 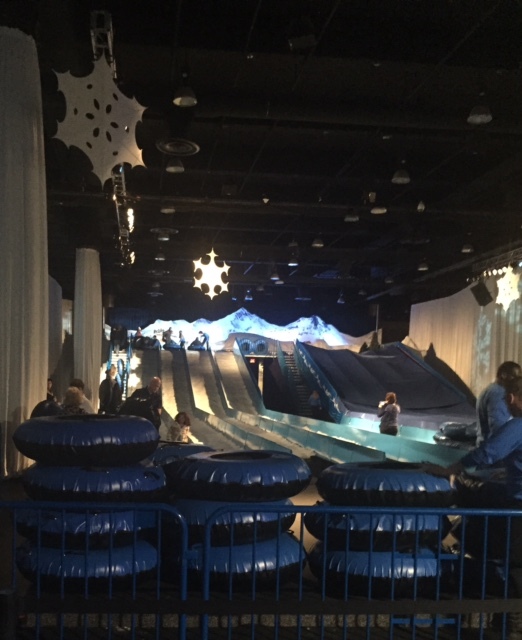 Also, guests can experience the adrenaline of Alpine Rush Snow Tubing – an 18’ 8-lane giant snow hill created with 1.5 million pounds of real Florida snow. This is SO MUCH fun. Kyle and I raced on the way down… I WON ! And don’t miss the all-new Cirque Dreams Unwrapped show at the Emerald Bay Stage. Be dazzled by an array of seasonal characters brought to life in a dreamscape of imaginative costumes and creativity, while stunning feats of showmanship are unwrapped, performed on stage and in the air, leaving audiences on the edge of their seats. The entire family can enjoy this uniquely inspired 25-minute Christmas dream presented with the Broadway style and inventive theatrics for which Cirque Dreams is renowned. Plus new this year is the Elf on the Shelf® Scavenger Hunt which will ignite your inner sleuth and take you on a journey throughout the holiday-clad hotel. 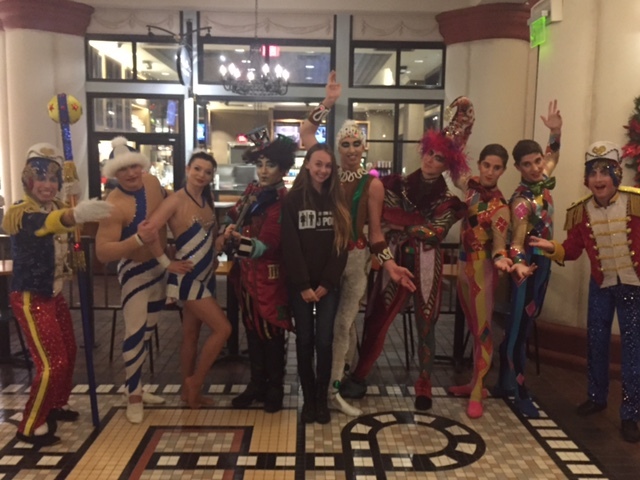 Participants will follow clues and scan the hotel to spot the 10 scout elves who have landed at Gaylord Palms. By solving puzzles and finding all of the elves, guests will reveal the elves’ names so they can report back to Santa. All families that complete the scavenger hunt will win a special prize. Mr. and Mrs. Claus will also be a part of the festivities. Photos with Santa will take place in Santa’s Workshop located in Alpine Village and Mrs. Claus will be a part of the all-new Brunch with Mrs. Claus at the award-winning Villa de Flora. Alpine Village, the holiday attraction hub, will also feature the Gingerbread Decorating Corner presented by PEEPS ®, Snowy’s Snack Shack and holiday shopping galore. Packages are on sale today. For more information and to purchase tickets, go to ChristmasatGaylordPalms.com. Gaylord Palms Resort is located five minutes from the gates of Walt Disney World at 6000 W. Osceola Parkway, Kissimmee, FL 34746. 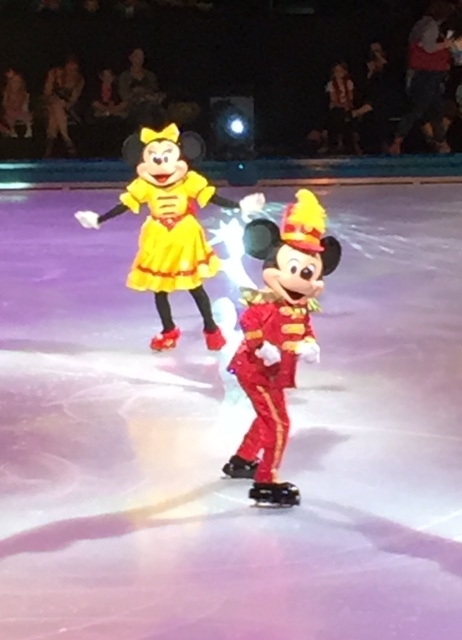 Last night I had the extreme pleasure of attending the Disney on Ice 100 Years of Magic show at the Amway Arena in Orlando, Fl. Even though I have teenagers, they were so excited to go. This is definitely a show for all ages !!! 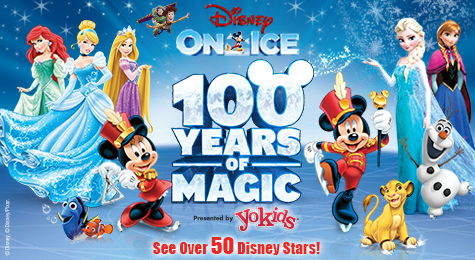 Mouse-ter of Ceremonies, Mickey Mouse, lead a parade of more than 50 beloved characters starring Minnie Mouse, Donald Duck, Goofy and featuring an ensemble of Disney Princesses including Cinderella, Rapunzel, Ariel, Snow White and Tiana. 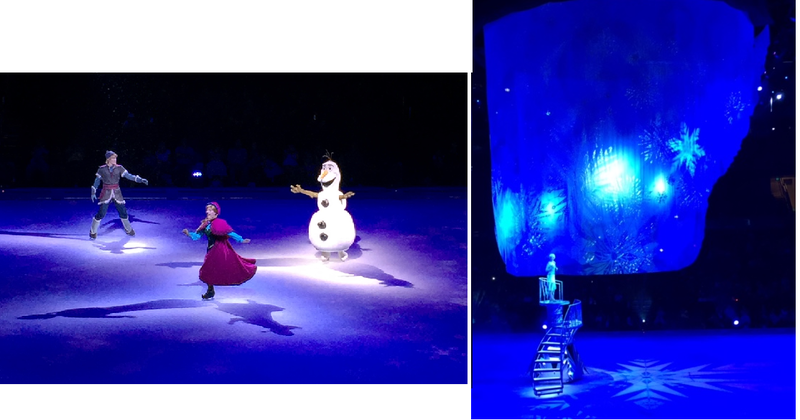 The wintry wonderland of Disney’s Frozen also came to life with Anna, Elsa, and the hilarious Olaf, as they discovered that true love is the greatest magic of all. Exciting moments from Disney•Pixar’s Finding Nemo, Disney’s Aladdin and Beauty and the Beast will leave the whole family with memories to last a lifetime. 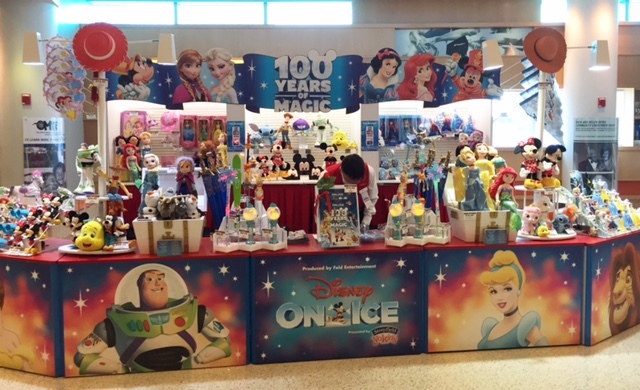 And make sure you bring a little spending cash because there are lots of great souvenirs to choose from such as Tshirts, light-up wands, dolls, and other toys. Florida Residents can enjoy a special deal on 1 day single park and 1 day combo water park tickets with the “I Love LEGOLAND” Promotion. This offer will give Florida residents 33% off ticket purchases made online only through 2/22/15 for dates available through June 5, 2015. I absolutely LOVE going to the Mardi Gras concerts at Universal Orlando. They are free with your paid admission (or if you have an annual pass you can go for free). 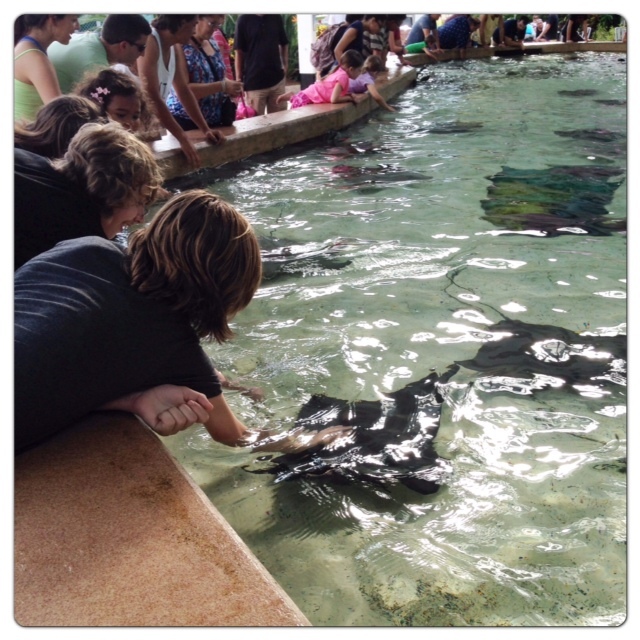 Busch Gardens® Tampa is kicking off 2015 with great ways to save…. For a limited time, guests can receive an Adventure Island® Fun Card FREE with the purchase of a Busch Gardens Fun Card, which lets guests pay for a day and visit both parks now through 2015. 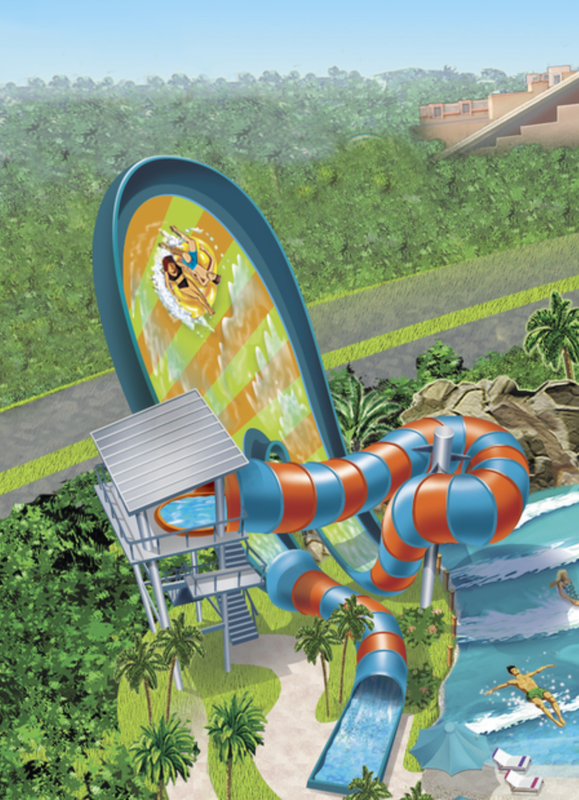 Enjoy the thrills of Busch Gardens through Dec. 31, 2015 and all the water-soaked fun of Adventure Island’s 2015 season, including the park’s newest family thrill slide, Colossal Curl™. The two-park Fun Card includes admission to an incredible lineup of events including Busch Gardens Tampa’s Real Music Series™, the inaugural Food & Wine Festival, Summer Nights, Christmas Town™ and Adventure Island’s Island Nights. Price does not include tax and service fees. Visit buschgardens.com for more information. To learn more about Preschool Pass, and to register, visit BuschGardens.com. Last weekend my family was invited to attend the kick off to SeaWorld’s Halloween Spooktacular which made me so happy because this is something we have done every year for about 12 years now. It is always so much fun no matter how old the kids get. Along with all the wonderful shows like Blue Horizons, Shamu and Alure of the Ocean, there is Sesame Street’s Count Down to Halloween which was such a cute show featuring The Count, Elmo, Zoey, Telly Abby and other great characters. 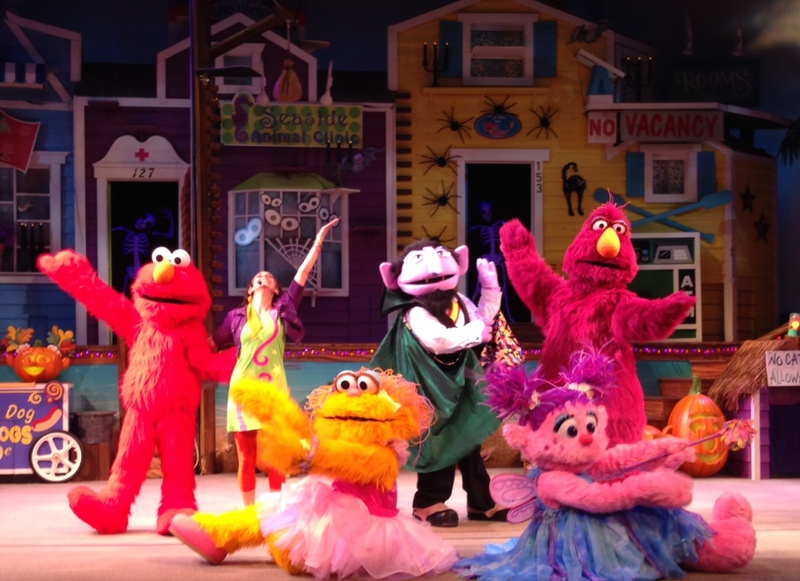 Your kids will have a blast singing along and dancing to this great Halloween count down show. Plus while in the park, you get to enjoy great rides like Kraken, Manta and Journey to Atlantis. And you can visit fun areas like petting the stingrays, feeding the dolphins or sea lions, splashing around in the splash pad at Happy Harbor and so much more. And if that isn’t enough, there are so many other fun Halloween themed things to do during the day like trick or treating throughout the park, visiting the party zone, decorating sugar cookies, getting creative with a Make It Take It pumpkin craft, and meeting all kinds of great Sea World characters who will make your day so much fun. 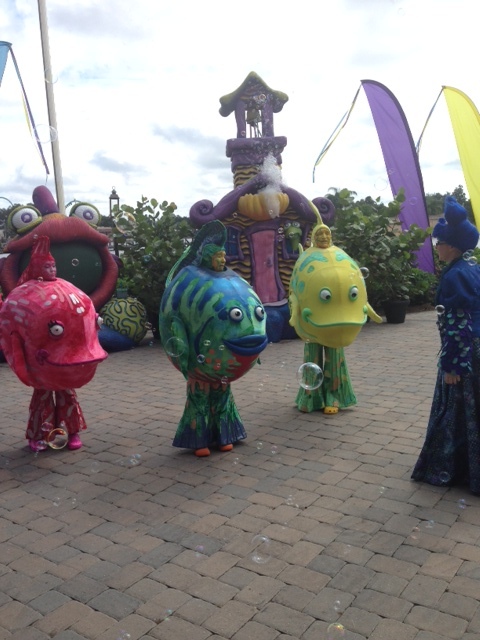 Located at SeaWorld’s Bayside area, this dynamic “underwater” environment comes to life each weekend with a live DJ encouraging kids to dance and sing along, a variety of interactive crafts, countless bubbles floating overhead and colorful pumpkin fish and other sea-themed characters gliding around for great photo opportunities! End your Spooktacular day with Princess Penelope and her undersea friends as children (and adults, too) can dance along to a Spooktacular mix of line-dancing favorites at the Village Square at the front of the park. 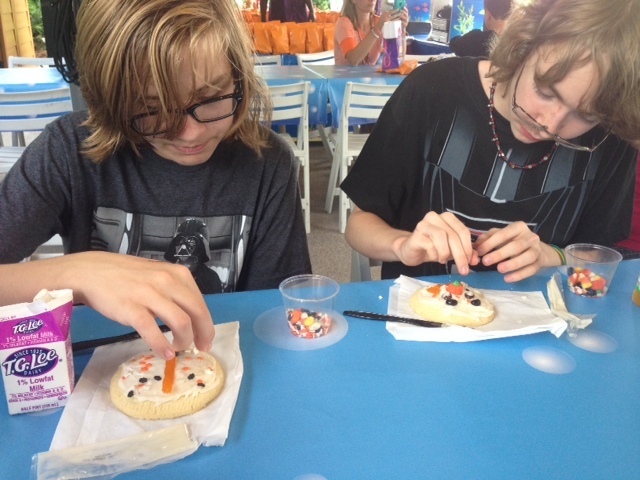 Kids and parents alike can have a “splash” creating their own sweet treats at the cookie decorating station. Kids can decorate and devour their spooky cookie when they purchase a kit that comes equipped with a cookie, frosting and toppings. Nominal fee. Rock the Universe at Universal Studios Orlando is back and will be taking place September 5th and 6th from 4 pm to 1 am. It’s an entire weekend of great music, real faith, best friends, fist-pumping rock, praise songs, autographs, shouts of joy, lifted hands and lifted hearts. Rock the Universe is a separately ticketed special event. Event held rain or shine. No rain checks, refunds or returns. Dates, times, entertainment, attractions and prices subject to change without notice. Parking fees are not included. Additional restrictions may apply.